Thanks for being here, dear reader. I can't tell you how much I appreciate your company. You kept reading, so I kept writing…And after two-and-a-half years at it, I've come to the two-hundredth recipe here on Hungry Cravings! That's right, I said Two! Hundredth! Recipe! And still counting! I spent a lot of time thinking of a recipe that would be worthy of number 200. I knew it had to be big. Huge. Irresistible. Better than chocolate, even. And if there's any one thing that's better than chocolate, it's lemon. Nothing makes the taste buds feel alive like lemon. 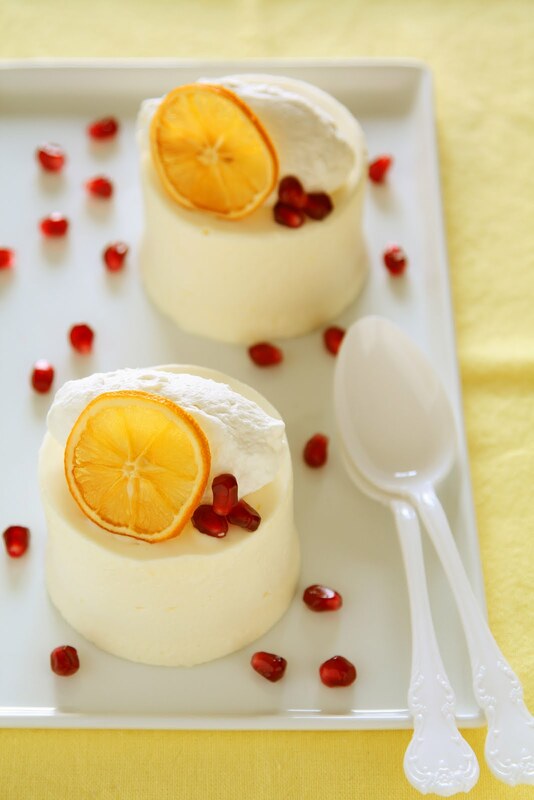 And now, dear reader, for the two-hundredth recipe…Drumroll please…May I present to you Frozen Meyer Lemon Mousse! "I'm obsessed with lemons," I mused between bites of the mousse. To which my husband replied, "Yeah, anyone who's read the first 199 recipes would know." Combine the lemon juice and lemon zest in a small saucepan. Bring to a boil and simmer for 2 to 3 minutes, or until fragrant. Strain through a fine mesh sieve. Return the lemon juice to the pan and add the sugar. Bring to a boil and simmer until an instant-read thermometer registers 230˚F. When the sugar syrup is nearly ready, start whipping the egg yolks in a mixer fitted with a whip attachment. With the motor running on high, add the hot sugar syrup in a thin stream. Continue to whip on high until light and fluffy and cooled to room temperature. Whip the cream to soft peaks. Stir 1/3 of the cream into the yolk mixture, then fold in the remaining cream. Divide the mixture among 8 acetate-lined individual cake rings on a parchment-lined baking tray. Freeze for 4 to 6 hours, or until solid. To unmold, transfer the frozen mousses to dessert plates. Slide off the cake rings and peel away the acetate. Serves 8. This light and refreshing dessert is super puckery and not for the faint of tart. Good any time of year, but especially in the winter when citrus is in season. You will need about 6 large Meyer lemons for this recipe. If you don't have cake rings, simply make and serve the mousse in ramekins. Serve with lightly sweetened whipped cream, if desired. Big congratulations are in order. I keep reading and am very happy you keep writing. So many good recipes ... quality ... and enjoyed! I'm still making your Beef Barley soup which is still my husband's favorite soup of all time. I make a pot about once a month or so and keep the leftovers in the freezer to satisfy his need. No matter what other soup I make he wants that one so that one it is. Again, BIG CONGRATULATIONS!! to a love well done. Lemons. Meyer lemons, no less. And mousse! Just a few of my favorite things all together in one :) Congrats on 200 recipes! Cooking classes are fun! You should definitely come—I'm sure you'll have a great time and learn a lot. Thanks for your kind words about my recipes, by the way. I think that lemons are especially nice at this time of year. Not only are they in season, they come around just when your tastebuds (and likely you in general) need some brightness. These sound great, and I might just have to give them a try. Excellent recipe.I used 1 cup of sugar to sweeten it a little and served it with fresh strawberries.Even my 4 year old granddaughter loved it. My mouth's watering. These look terrific! These were so easy to make, it seems like something this good should be more work. They are like eating soft frozen clouds. Delicious!